With huge viewing windows, the RH lifting-door (LD) models will make a striking feature in your room - the RH 21 Panorama Ultra XL offers the largest view of them all, with a door that is 1.8 metres wide! Not only do they look stunning, but they are also really well designed. The combustion system has primary, secondary and tertiary air feeds, which ensures a wonderful flame pattern and controllable burn, and an efficiency of over 80%. They can be fired up to get a space warm quickly but, with the trademark Woodfire control, can easily be set to tick over with a few logs laid along the length of the firebox. With the addition of an optional convection cover, warmth can also be ducted to other areas of your home. 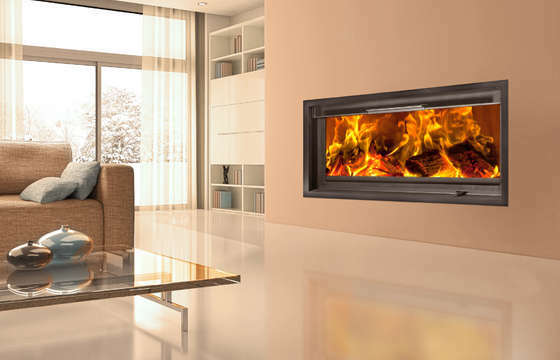 The build quality of the RH LDs is superb, with smooth up-and-down doors that make refuelling easy and allow you to enjoy a real open fire if desired. For further information, please call 01404 892892.